Overcoming the odds and learning from constant failure are at the heart of roguelite games. Victories are few and far between, and the fun is found in the struggle to adapt to an ever-changing game. 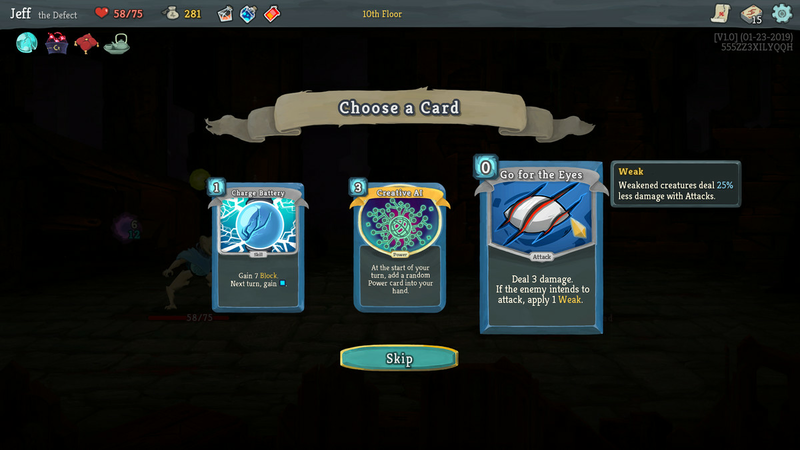 When I started playing Slay the Spire, a deck-building roguelite now available on Windows PC, I assumed the game would follow the same sort of progression. However, after 10 hours, I learned that mastering Slay the Spire doesn’t come through learning the game’s systems, but rather by dismantling my assumptions about how it all works. In Slay the Spire, I play as one of three unique characters, in order to fight my way through a randomly generated map filled with battles, treasure chests, and RPG-like encounters. Combat is similar to that of a turn-based RPG, but instead of selecting attacks and spells from a menu, I draw cards from each character’s specific pool of cards. These cards allow me to attack, defend, cast spells, or use special abilities. Each character has their own set of cards, making their play styles radically different. At the start of each playthrough, all I have is a generic deck, filled with basic attack cards, defense cards, and some skills. But every time I take down a foe, I get the option to add one of three new cards to my deck, drawn from the large pool of possible cards available to each character. These cards can unlock new, specific skills, and allow me to build diverse styles of decks using the generic cards as a foundation. I thought I had a grasp of all of this at first; I’m used to playing both card games and roguelikes, after all. But even after a few hours, I was constantly losing and not making much progress. This isn’t uncommon in roguelites, and while I was having fun, I still felt like I must be missing something, since I was struggling so much. I assumed each class had a fairly straightforward approach to deck-building: The soldierlike Ironclad is a high-damage fighter, the Silent is a poison-chucking rogue, and the Defect is a robot that casts magical orbs. But after failing repeatedly, I knew I needed to take a different approach. One of the first mistakes I made was adding too many cards to my deck. Since there’s no limit, I just kept adding cards that seemed interesting. For instance, the Defect can cast four different types of orbs to power itself up. In my naïveté, I kept grabbing cards to add all four types to my deck, unaware that they really don’t mix well at all. With so many cards to choose from, it can be overwhelming at first. As I got further into the game, I was eager to make use of all the new cards I earned along the way. It turns out that the more cards I have, the less likely I am to draw my more essential cards. This is deck-building 101, but it’s easy for me to fall into this bad habit when I first start playing games like this. After poring over some guides from the game’s early access stage, I picked up a few new tactics. One of the most important — and counterintuitive — recommendations was to get rid of my basic attack cards. Throughout the game, I can run across a shopkeeper along one of the many randomly generated paths. Among their wares is the option to remove cards from your deck for a price. I had originally assumed that I was meant to use this to remove negative cards I randomly received, such as ones that might damage me when I draw them, or are just useless cards that eat up precious space in my deck. What I soon learned is that I can pay the shopkeeper to remove other “negative cards” — namely, my generic attack cards. While these are good for the early game, when they are my only means of attack, my character’s skill-based cards end up being more interesting and efficient ways of dealing damage. Soon, those basic attack cards actually end up taking up room that I should reserve for more powerful, higher-value cards. This small change made a huge difference for me as I got further into the game, where enemies hit much harder. If I were still relying on basic attack cards, there’s no way I’d be able to match their strength. But if I remove those cards to make way for better ones, I can topple them with ease. The shopkeeper sells cards, items, and the ability to remove cards. I also learned to buck my expectations for the kinds of decks I should build. The key to deck-building games is constructing a thematic deck where each card complements the others. In card games like Magic: The Gathering, this is easy enough to do, since you do all your planning before a match — not in the moment, like in Slay the Spire. Since I’m given a random set of cards to build a deck from at the end of each encounter, I can’t go into any run with a certain deck-building goal in mind. I have to quickly decide on long-term deck designs based on what cards are available to me after a battle. 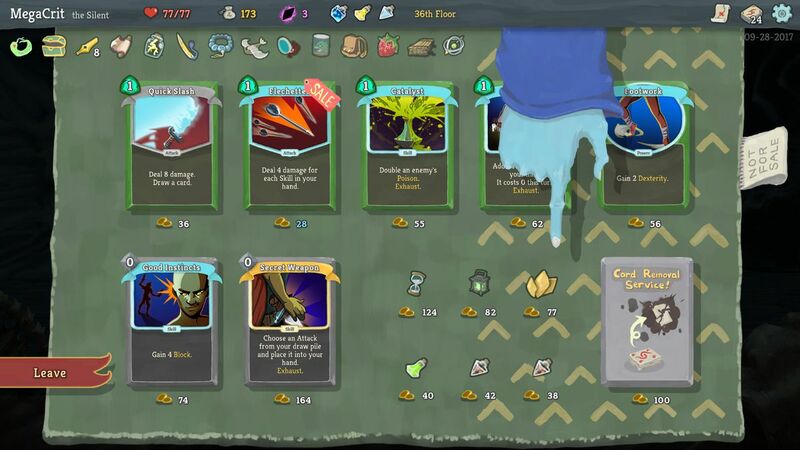 The trick with Slay the Spire is to think more creatively and proactively than the typical card game requires of me. For instance, my favorite deck to use with the poison-chucking rogue has nothing to do with its ability to infect enemies. I have way more fun, and success, using cards to summon an infinite supply of throwing knives. My most effective deck for Defect, the magical robot, also has nothing to do with its innate talents. It relies on a few physical attack cards whose strength stacks the more I use them. The cards you pick in the early game can dictate an entire run. 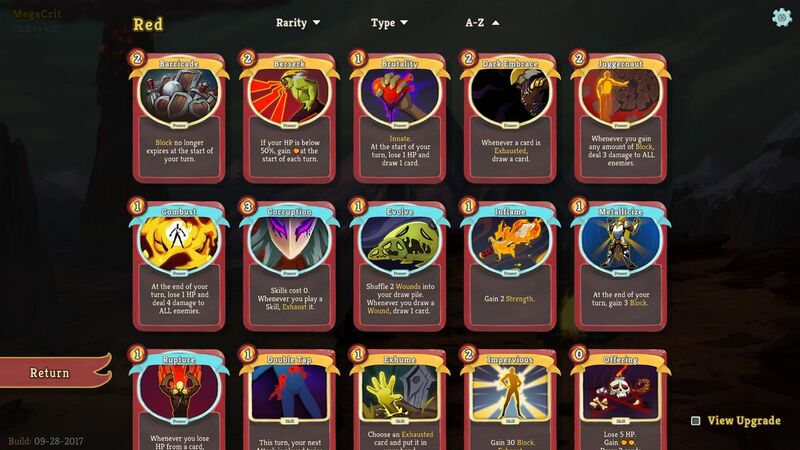 Roguelites teach their lessons in often devastating ways, and Slay the Spire is no different. Each new run can feel punishing and, at times, unfair. It wasn’t until I learned how to trim the fat and come up with counterintuitive deck ideas that I really started falling in love with the game. Now that I have a few tricks up my sleeve, I can’t wait to experiment with them further until I get that perfect run. Slay the Spire was reviewed on Windows PC; it is now available on Steam, and a Nintendo Switch version is coming in early 2019. You can find additional information about Polygon’s ethics policy here.